Will you choose a standard response over a quick response sprinkler head? Did you know there are actually six different characteristics that define a sprinkler system’s ability to control a fire? These characteristics include thermal sensitivity, orifice size, temperature rating, special service conditions, water distribution, and installation orientation. Along with these characteristics, there are two different categories of sprinkler heads you can choose from: standard and a quick response head. Each of these sprinkler systems comes with a selection of the individual characteristics in order to protect your business effectively. So how do you know which type of sprinkler head you should choose? Let’s take a look at the standard and quick response sprinkler heads and where they are primarily used. The standard response sprinkler’s mission is to pre-wet the materials around the fire in order to remove the fuel source. This sprinkler head soaks the surrounding area to slow the fire and buying critical time for the fire department to extinguish the fire. These sprinkler heads are commonly found in warehouses, factories, and other commercial buildings. Standard response heads are individually activated and will only activate directly above the active fire. 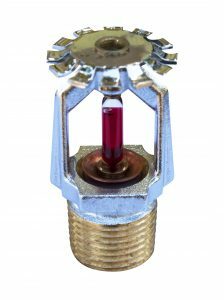 Quick response sprinkler heads are generally used for light hazardous situations, like in schools and office buildings, where a quick response is needed. These sprinkler heads have a similar fire-control application to standard response heads but with a slightly different focus. Quick response sprinkler heads discharge water to keep the fire from climbing up walls and to maintain lower ceiling temperatures. A cooler ceiling will help reduce the possibility of flashovers and will slow the fire’s rise from inside the building. They can also help improve the odds of human survival. One of the biggest differences between a standard response and a quick response is the bulb size. The smaller the bulb is, the quicker the response time. A standard response head used a 5MM glass bulb that is filled with a glycerin-based liquid. The thicker bulb indicates a longer response time than the quick response heads. Quick response heads have a 3MM glass bulb and are quicker to respond to the headed room. While the quick response heads may seem like the obvious choice, you should also consider your space including ambient temperatures, ceiling height, and the size of the area that needs to be protected. These factors will be able to determine what kind of sprinkler heads you should use in your commercial space. Talk to your Fireline representative for more information on choosing your sprinkler heads today! This entry was posted on Friday, July 29th, 2016 at 9:06 pm. Both comments and pings are currently closed.